Preliminary data from U.S. sales of Apple's newest iPhones suggested that the larger 7 Plus was outselling the smaller 7, which would be a first, a market research firm said today. 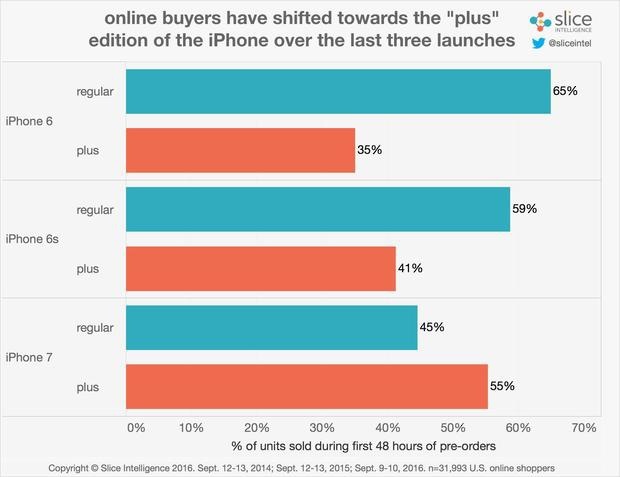 Of the iPhone 7 online pre-orders during the initial 48 hours of availability, 55% were for the 5.5-in. iPhone 7 Plus; the remaining 45% were for the 4.7-in. iPhone 7. That was the first-ever flip to the Plus size in the three annual cycles since Apple offered a big-screen iPhone in 2014. According to Palo Alto, Calif.-based Slice Intelligence, U.S. buyers of the iPhone 6 or 6 Plus two years ago leaned toward the former in a split of 65% to 35%. The gap narrowed last year with the 6S and 6S Plus, when the smaller iPhone 6S accounted for 59% of the total, and the 6S Plus with 41%. Pre-orders for the iPhone 7 Plus outpaced those for the iPhone 7 by a range of 55% to 45%, says a research firm that tallies U.S. consumers' emailed receipts. Slice based its data on a sampling of approximately 4 million U.S. consumers. Those people have opted in to Slice's services or apps -- including the same-named shopper's assistant app for iOS and Android -- or those of partners which license the firm's technology, and so give Slice access to their email inboxes. Slice sniffs through the inboxes, then spots and copies emailed receipts for online orders. Apple does not disclose the sales splits between iPhone models -- or the various versions of its other hardware for that matter -- but instead tallies all iPhones into a single number for each quarter. Slice's data hinted at a larger gross revenue number for Apple in the U.S. this launch cycle: The iPhone 7 Plus sells for $120 more than the iPhone 7. Not surprisingly, Slice's email receipts also showed that the iPhone's new Black and Jet Black colors were the two most popular for pre-order customers, replacing the now-extinct Space Gray, which had been the top choice for the last two years. Nearly half of all iPhone 7 and 7 Plus orders (46% to be exact) were for the Black, said Slice, with another 23% were for the Jet Black. Jet Black, a new highly polished finish, has been in short supply, high demand, or both: Apple ran out of that color almost as soon as pre-orders opened on Sept. 9. Currently, a Jet Black iPhone 7 Plus will ship to U.S. buyers sometime in November, according to Apple's e-mart, while a Jet Black iPhone 7 will ship three to five weeks after ordering.